Here's a great way to recycle those shopping carts you see thrown over the side of the road or into a swamp. 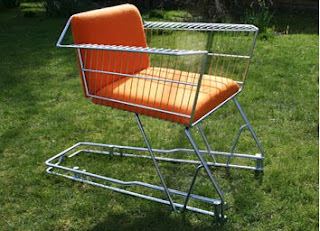 Just kidding, sort of...Fondly known as Annie's shopping trolley chair, the shopping cart chair was born in 2001. I'd say it's a great use for the retired shopping cart and although I've never tried one but it looks pretty comfortable to me! Ouno makes one of a kind pillows and other accessories for the home from "upcycled" (as ooposed to recycled) vintage fabrics and textiles, old curtains for example, that are in excellent condition. 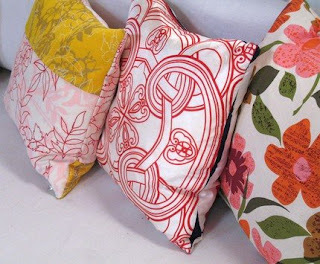 The result is fresh modern designs--like these pillows. pillows are filled with 100% new feathers, but bamboo filling (a bit more lumpy but sustainable) is also available.